It’s the Monday of Holy Week! Hooray! 1 Six days before Passover Jesus came to Bethany, where Lazarus was, whom Jesus had raised from the dead. 2They gave a dinner for him there, and Martha served, while Lazarus was one of those reclining at table with him. 3Mary took a liter of costly perfumed oil made from genuine aromatic nard and anointed the feet of Jesus and dried them with her hair; the house was filled with the fragrance of the oil. 4Then Judas the Iscariot, one [of] his disciples, and the one who would betray him, said, 5“Why was this oil not sold for three hundred days’ wages and given to the poor?” 6He said this not because he cared about the poor but because he was a thief and held the money bag and used to steal the contributions. 7So Jesus said, “Leave her alone. Let her keep this for the day of my burial. 8You always have the poor with you, but you do not always have me.”9[The] large crowd of the Jews found out that he was there and came, not only because of Jesus, but also to see Lazarus, whom he had raised from the dead. 10And the chief priests plotted to kill Lazarus too, 11because many of the Jews were turning away and believing in Jesus because of him. This is actually a common role for Mary Magdalene to be in… at the feet of Jesus. She is famous for sitting at Christ’s feet and listening to His words while Martha toiled away — much to Martha’s annoyance. When Lazarus died, she threw herself at Christ’s feet and declared that, were Jesus there, Lazarus, her brother, wouldn’t have died. And now here, at this gospel, she anoints His feet with perfume and dries them with her hair — a fact that the greedy Judas (whom we will talk about later on Spy Wednesday!) cannot tolerate. So, Mary Magdalene is indeed associated with the feet of Jesus! Yet, while there is artwork of all of these cases, the most common artwork of Mary Magdalene at the feet of Jesus? 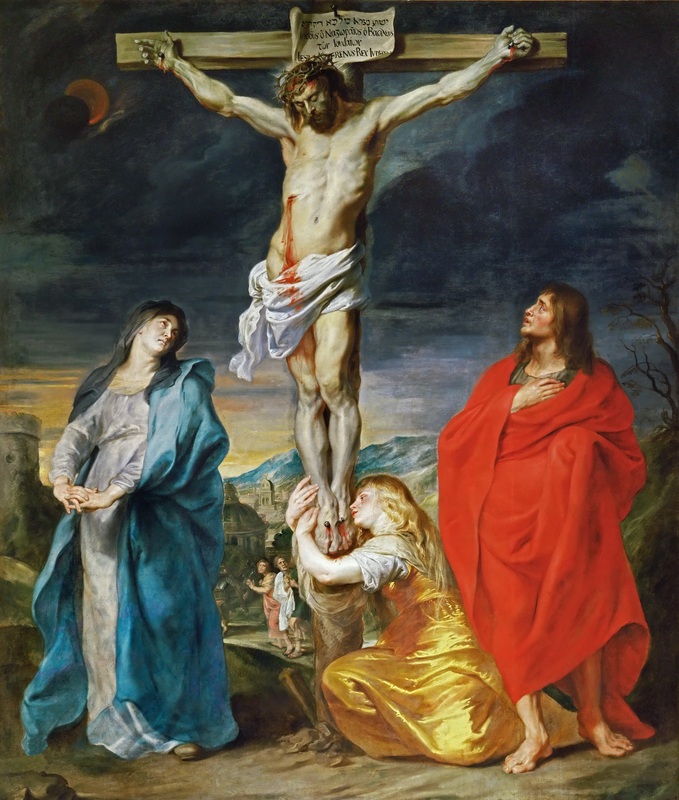 Christ Crucified with the Virgin, Saint John and Mary Magdalene, by Anthony van Dyck, c. 1617-19. Louvre Museum, Paris, France. In the background of this picture, there is chaos — two disciples of Jesus, presumedly, seem to rush off while taking a last glance at Jesus. Soldiers march away. The sky is eerie and strangely colorful and the sun is being eclipsed by the moon. It is an eerie scene, overall! But that doesn’t matter for the people in the foreground –Mary, the mother of Jesus, John, the beloved disciple, and Mary Magdalene. While the chaos of the world goes on behind them, their eyes are focused on Jesus. And Mary Magdalene, once more is seen adoring and kissing the feet of Jesus. May we imitate St. Mary Magdalene and adore You, even when and especially when our lives are filled with chaos. May we never forget to love You! This picture is featured in my book, The Sorrowful Mysteries, which pairs artwork of the Sorrowful Mysteries with the prayers of the Rosary. To take a look and buy it, click here!